Fernanda Santos covers Arizona and New Mexico as the Phoenix bureau chief for The New York Times. The Fire Line is her first book. "Meticulously researched and as dramatic as any thriller, Santos's account of the 2013 Arizona wildfire that killed 19 firefighters will keep you on the edge of your seat and break your heart." "The Fire Line is as powerful and consuming as the elemental force at the heart of this real-life drama.Fernanda Santos has captured fire on paper, turning painstaking reporting into a gripping narrative. The brave men of the Granite Mountain Hotshots have received a tribute they so richly deserve." 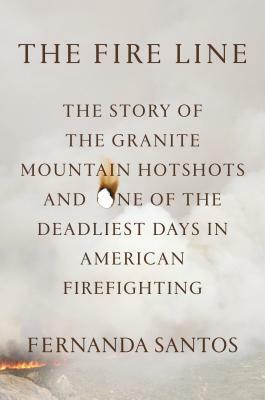 "In her gripping account of the Yarnell Hill tragedy of 2013, Fernanda Santos skillfully strikes a balance of wildfire science and unfolding human drama. As fast-paced as the disaster it covers, The Fire Line kept me turning pages, and left me with indelible images long after the fire was out. A deeply respectful tribute to the Granite Mountain Hotshots and firefighters everywhere."